Silly String is made of a mixture of components dispersed throughout a liquid solvent in the product’s aerosol can. These substances include a polymer resin that provides the string’s structure, a plasticizer to tune the physical properties of the string, and a surfactant that promotes foaming of the product. Other ingredients include silicon fluid (to make the strands easier to clean up), flame retardant, and a pigment for color. A key component in Silly String is its aerosol spray can and the propellant that ejects the product mixture from the can. The product originally used chlorofluorocarbon propellant Freon 12 mixed with Freon 11, both part of a group of compounds that damage the ozone layer. In 1978, the United States banned the use of CFCs like Freon 11 and 12 in aerosol cans. The manufacturers then changed the formulation to use permitted propellants. Aerosol propellants are liquids with very low boiling points. When under pressure inside the can, the propellant is in liquid form, but when the nozzle is opened, it rapidly escapes – along with the compounds mixed in it – and evaporates as it enters the air. The string takes shape as the propellant evaporates. The inventors sought to control the ratio of compounds in the product to form a string that holds itself together while remaining slightly sticky to the touch. This allows the product to weakly adhere to people and windows, for instance, but easily be cleaned up without the string falling apart or staining inert surfaces. The current formulation is not published, but one of the primary recipes in the original patent calls for 12.2% of the synthetic resin poly(isobutyl methacrylate) by weight. It additionally calls for 0.5% of the selected plasticizer, dibutyl phthalate, 2.5% of sorbitan trioleate surfactant, 0.35% silicon fluid such as dimethyl siloxane or methyl phenyl siloxane, 5.6% of flame retardant hexabromobenzene, and 2–3% pigment (all percentages by weight). The aerosol propellant represents the bulk of the product. Solubility of the resin and other materials in the product is enhanced by addition of another solvent, originally Freon 11, in 6.6% by weight. The invention of the original silly string was accidental. In 1972, A United States Patent was issued to Leonard A. Fish, an inventor, and Robert P. Cox, a chemist, for a "foamable resinous composition." The partners initially wanted to create a can of aerosol that one would be able to spray on a broken/sprained leg or arm and use as an instant cast. Their invention worked, but when it came down to packaging the can, the two had to test 500 different kinds of nozzles. After having gone through about 30 or 40, Fish came upon one that produced a nice string, which shot about 30 feet across the room. This incident inspired Fish to turn the product into a toy. After altering the formula to be less sticky and adding colors, the pair decided to market their product. Because neither of them knew how to sell toys, they made an appointment with Wham-O in California. Fish describes how, during that meeting, he sprayed the can all over the person he was meeting with and all over his office. This person became very upset and asked him to leave the premises. One day later, Fish received a Western Union Telegram asking him to send 24 cans of "Squibbly" for a market test immediately, signed by the same individual who had kicked him out. He called them back and explained that, after he had finished cleaning up his office, the two owners of Wham-O had come back to talk to him, and one had noticed a piece of the string on a lamp shade – he had overlooked it while cleaning up. He explained where the string came from and the owners quickly asked him to send samples over for a market test. Two weeks later, Wham-O signed a contract with Fish and Cox to license the product now known as Silly String. Silly String was licensed to and produced by Wham-O, in a range of colours including blue, red, and green, until the Car-Freshner Corporation, the maker of Little Trees, acquired the Silly String trademark in 1997. Silly String Products, a division of Car-Freshner Corporation, manufactures Silly String in the United States and distributes Silly String in North America through big box stores, party supply stores, toy stores and drug stores. The U.S. Patent #3705669 includes a clear description of preferred implementations. Similar toys are Goofy String, Streamer String, Wacky String and Nickelodeon Smatter. In December 2006, Tween Brands Inc., a retailer of girls' clothing and accessories in the United States, was fined $109,800 by the United States Environmental Protection Agency for "allegedly distributing canned confetti string damaging to the ozone." EPA said the product marketed under various names by the retailer damages the stratospheric ozone layer. The production and use of chemicals harmful to that layer is controlled by U.S. federal law. Silly String and similar products have been used by the military to detect tripwires for explosive booby traps. The string is sprayed over the suspected area, and if the string falls to the ground, no tripwires are present since the string would catch on the tripwires (but is not heavy enough to activate the explosive). As of 2006[update] it was being used by U.S. troops in Iraq for this purpose. However, because the material is an aerosol, it cannot be shipped privately to Iraq and it is not provided by official channels. Thus, 80,000 cans were unintentionally stockpiled in New Jersey. In October 2007, a shipping company with the required credentials was finally found. The use of aerosol string products has been banned in several places for various reasons, including cleanup and removal costs and fears of potential damage to house or vehicle paint. It has been banned in the city of Ridgewood, New Jersey and a number of other places, and also at some public gatherings and events. The town board of Huntington on Long Island banned the sale of Silly String within 1,500 feet (460 m) of the route of a parade. In 2001, the town of Middleborough, Massachusetts banned Silly String; offenders face a $300 fine. In 2004, Los Angeles enacted a city ordinance (LAMC Section 56.02) to ban aerosol string in Hollywood on Halloween night. ^ "Foamable Resinous Composition". Retrieved 2007-10-16 – via Google.com. ^ "EPA reaches agreement with Tween Brands on clean-air". U.S. Environmental Protection Agency. 2006-12-04. Retrieved 2011-09-27. ^ "Schneier on Security: Military Uses for Silly String". Bruce Schneier. Retrieved 2007-10-16. ^ "Not So Silly String". Kit Up (Military.com). Retrieved 2007-10-16. ^ "N.J. woman collects Silly String for serious use". MSNBC.com. Retrieved 2007-10-16. ^ Martens, Ellin (November 19, 2006). "Not So Silly String In Iraq". Time.com. Retrieved 2007-10-16. ^ "A Serious Use For Silly String". CBS News. December 6, 2006. Retrieved 2007-10-16. ^ "'Silly String' is saving lives over in Iraq". The Raw Story (Fox News). Archived from the original on 2007-10-12. Retrieved 2007-10-16. ^ Applebome, Peter (September 20, 2007). "Toy Goo Might Save Some Soldiers' Lives, but It's Stuck Here". The New York Times. Retrieved 2007-10-16. ^ "Silly String care packages on the way to troops, at last". USA Today. AP. 2007-10-15. Retrieved 2011-09-27. ^ Sanders, Alain L.; Horn, Dara (1998-07-06). "Banned in the U.S.A." Time. Retrieved 2011-09-27. ^ "American towns mull swearing & Silly String bans". Associated Newspapers. Retrieved 2011-09-27. ^ \ "Town By-Laws". Bellicose Bumpkin blog. May 9, 2012. 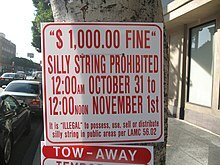 ^ "Silly String Banned In Hollywood This Halloween". Lapdonline.org. Los Angeles Police Department. October 2004. Retrieved 2011-05-15. ^ "Art 6 Ch 5 Sec 56.02" (PDF). Los Angeles Municipal Code. Retrieved June 30, 2013. Wikimedia Commons has media related to Aerosol string. This page was last edited on 13 December 2018, at 06:52 (UTC).